Weekly Market Analysis: December 14th to 18th 2015 - Find the best Binary Options Brokers, Binary Options Bonuses, Binary Options Signals, Binary Options Software and everything Binary Options related on Binary Options Directory! 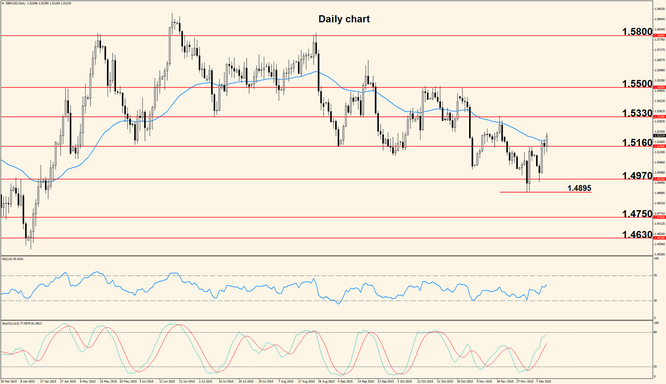 Weekly Analysis: Last week the bulls continued their assault and managed to take the pair higher after an initial drop below 1.0825 support zone. The momentum faded during the last two days of the week but a new push is not out of the question. The pair paused around 1.1040, which is now short term resistance, but this level didn’t push price significantly lower once touched so we will most likely see another attempt to break it this week. 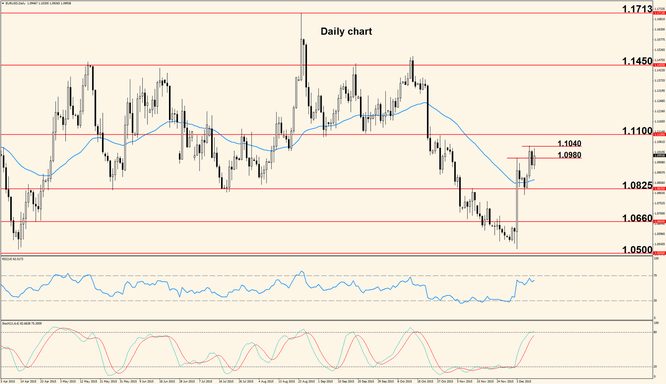 A more important resistance zone is located around 1.1100 and we expect this target to be reached during the week ahead. The oscillators are approaching overbought and this is a possible reason for downside action but the extent should be limited. Considering the huge U.S. event scheduled for this week, we anticipate massive moves, with the technical side being overshadowed by the fundamental. The week starts slow as no major data releases are scheduled Monday but Tuesday action picks up with the release of the German ZEW Economic Sentiment survey and the U.S. Consumer Price Index which is the main gauge of inflation. Wednesday is a huge day for the US Dollar as the Fed will announce their long awaited interest rate decision, along with a Statement and followed shortly after by a Press Conference. The rate is expected to increase from the current <0.25% to <0.50% and even if there’s no guarantee this will happen, the whole cluster of events will most likely generate massive volatility. Thursday the German IFO Business Climate survey is released, followed later in the day by the Philly Fed Manufacturing Index, which is a measure of the performance of the manufacturing sector, derived from the opinions of surveyed purchasing managers. The week ends like it started, with no major events scheduled Friday. The first two days of last week were controlled by the sellers and it seemed like the pair will descend below support; however, this was not the case and the bulls reversed direction, creating a new high. After surpassing 1.5160, the pair breached the 50 period Exponential Moving Average and the week ended above it. Last time price had an encounter with the moving average, it resulted in a bounce and a drop lower but notice the fact that last time a Daily candle was not closed above the EMA. This time it has closed and there are no signs of rejection (no long wicks in the upper part) so we anticipate the current move to extend into the zone around 1.5330. The U.S. rate decision will play a major role in the pair’s direction. The first important event for the Pound is the British Consumer Price Index scheduled Tuesday. As we know this is the main measurement of inflation and usually higher numbers strengthen the Pound. Wednesday the Claimant Count is released, showing the change in the number of persons who applied for unemployment related support; higher numbers are detrimental for the economy and thus for the currency. The final market mover for the Pound is scheduled Thursday in the form of the Retail Sales; these sales account for the main part of overall economic activity so higher numbers suggest a thriving economy and usually a stronger Pound.